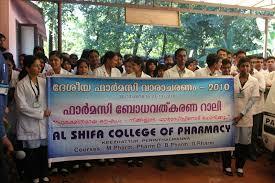 Al-Shifa College of Pharmacy is located in Kerala. The education institution was established in the year 1989. The College was affiliated to Kerala University of Health Sciences, Trissur. Al-Shifa College of Pharmacy offers various courses like B.Pharmacy, M.Pharmacy. The college has a well developed infrastructure and facilities like Medical lab, Auditorium, Sports and more. The college has well trained and experienced faculty members. Al-Shifa College of Pharmacy address, contact number is provided in contact details. Candidate must qualify Kerala CEE Entrance Exam Test. Candidate should be completed Bachelors Degree (10+2+4) system or an equivalent qualification with a minimum aggregate of 55%.